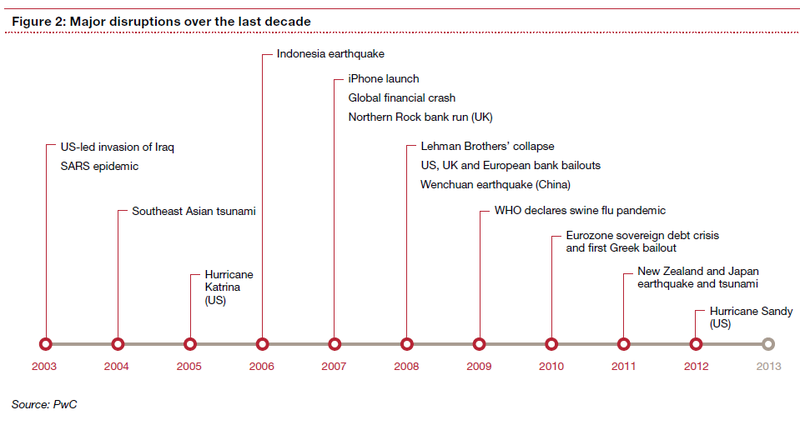 A PWC report on dealing with disruption contains this their summary of disruptive events since 2003. Its interesting that amongst all the natural cause events and economic events, that iphone launch is of the same magnitude as them. I am certain former the success stories and now failures; Nokia, Motorola, Sony, Panasonic and Sharp would all agree. What was disruptive about the swine flu pandemic? Or the Japanese tsunami? Japan seems to be pretty much the same as before the tsunami as far as I can see. Yes its an odd collection of disruptive events. PwC have taken a literal definition of disruption meaning significant interference with the business. Re Japan; my observation is that it is definitely not the same. Two of the events on the list (Global Financial Crisis and iPhone) have driven changes in business models that were long overdue. iPhone and associated touch screen technology caught all the Japanese manufacturers flat footed and they went from internationally leading personal devices to no-where over night. That coupled with the global flight of capital to ‘safe havens drove the value of the yen up by 60% which killed Japanese exports. So aside from word definition of the word disruption, business is changed inexorably in Japan imho.